Maziar Bahari is an Iranian born journalist who was arrested in Iran for unjustified crimes while covering the 2009 elections for Newsweek magazine. Bahari was thrown into prison, accused and interrogated for being a foreign infiltrator, and beaten for 118 days. The film, adapted for the screen from Bahari’s memoir “And Then They Came For Me: A Family’s Story of Love, Captivity, and Survival”, is directed by well known comedian and political satirist Jon Stewart who was the host of “The Daily Show”. 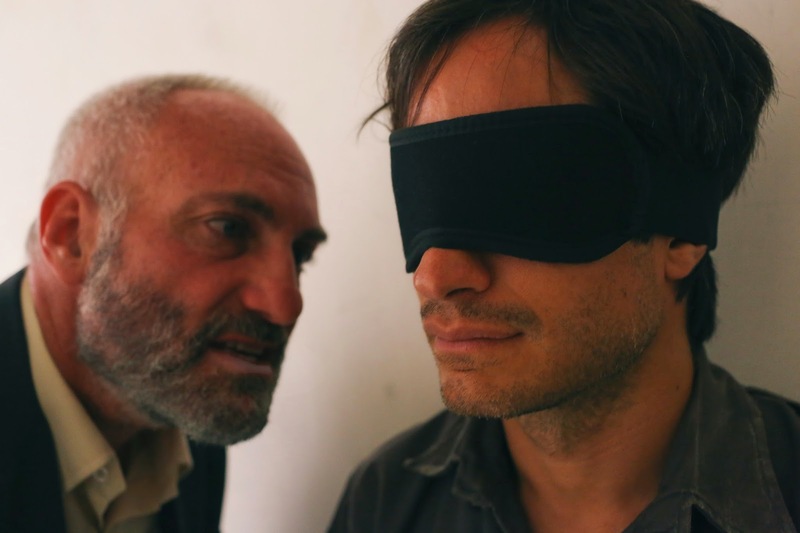 “Rosewater” marks Stewart’s first directorial offering, and the results are personal, intriguing, and rather accomplished. 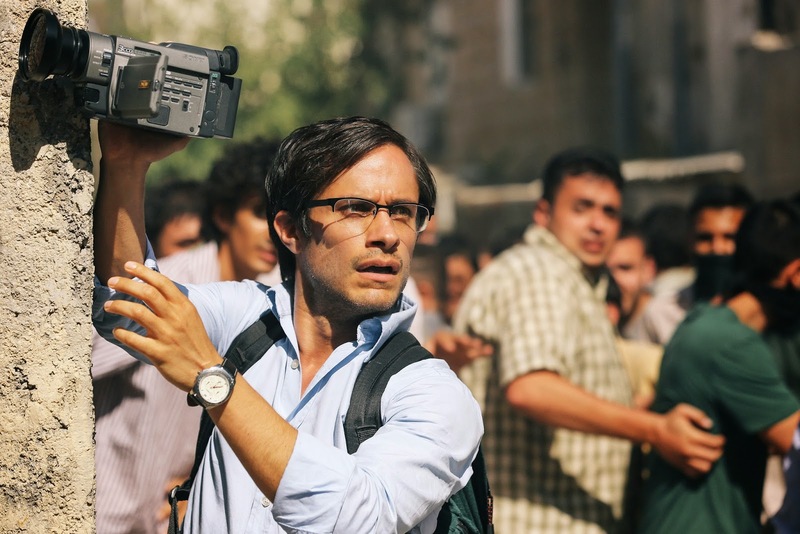 Bahari (Gael García Bernal) awakens in his old room in his mother’s home with a group of men standing in wait to search his possession and interrogate him for crimes against Iran. Bahari, living in London and reporting for Newsweek, is only home to cover the elections, which have split the country into two factions of opposition for two different candidates. Bahari, having temporarily employed a politically driven taxi driver named Davood (Dimitri Leonidas) to drive him around Iran, trudges through the streets on a motorcycle. Iran is in conflict after the results of the election, leading to an uprising and conflict in the streets. Bahari videotapes an encounter and sends it to a foreign news source, which leads to his arrest. Stewart has made a career off mocking political figures and the news agencies that cover them. With “Rosewater” Stewart is decidedly more serious, crafting a film that takes a deeply personal look at Bahari’s imprisonment and the past that shaped his ultimate motivational strength to persevere. The film begins with an expanded look at the culture of Iran and the depiction of how Bahari is different than other Iranian people, less traditional and perhaps more westernized. A scene of Bahari enjoying “The Sopranos” or being introduced to Leonard Cohen by his sister further reiterates the difference. Stewart gives these scenes a natural pacing, quickly moving through environments and establishing the tone of the film while also supplying comedic touches that fit nicely into the narrative. Situations swiftly turn serious as Bahari is imprisoned, interrogated by a man Bahari nicknames Rosewater, an excellent performance from Kim Bodnia, because of the fragrance he wears. Stewart’s best work happens here, intimately taking the viewer into the suffocating cell where Bahari will spend months. 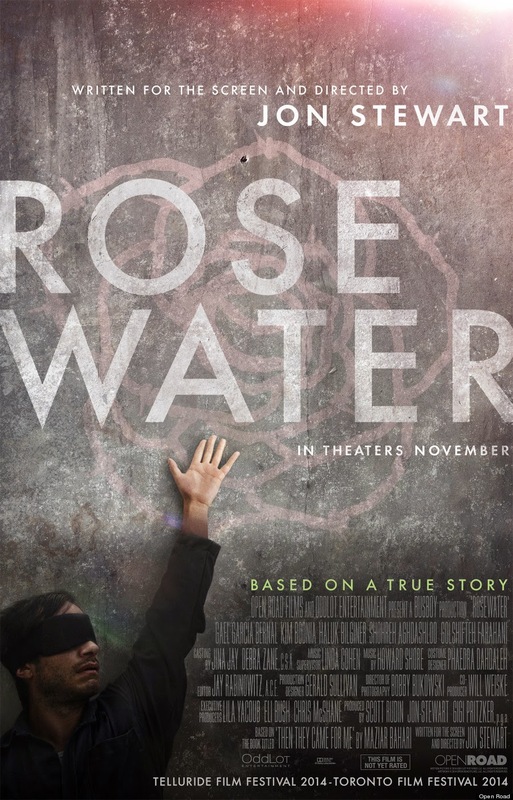 In this time he is blindfolded and lead forcefully throughout the prison, interviewed and inanely accused by Rosewater, and offered supporting guidance by visions of his deceased father (Haluk Bilginer) and sister (Golshifteh Farahani), who were also imprisoned. Stewart evokes a spectator perspective here, assisted by the skilled lens of cinematographer Bobby Bukowski, "Rosewater" shines during this section. While the story moves with ease there are a few choices that restrain the overall potential of the film. Gael García Bernal is a fine actor but feels somewhat miscast for this role. The tone shifts just when the film seems to be finding its stride, many times maintaining a safe approach during aggressive scenes, which restrains the emotional connection. There are also moments when undermining comedy is employed at the wrong time. Still, “Rosewater” is a good first feature for Jon Stewart who proves a skillful filmmaker willing to make purposeful and personal stories.